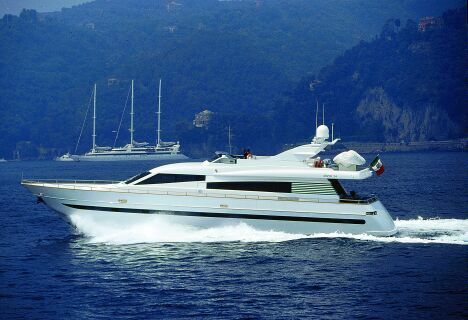 The vague impression of "noises off", just distinct enough to make out four brusque orders to the line-handlers to cast off from the Santa Margherita pier; then the coastline begins to glide past outside the large windows and the Diano 24 puts out to sea, a silent white ghost in the haze of early summer. The Master opens the throttle and the yacht eases forward: 15, 20, 25, 30 knots; the speed is apparent from the instrument panel and from the way in which Portofino is looming ever larger - not from anything else. In the cool and cosy atmosphere of the saloon, you have no idea that it's actually 35 degrees outside, while Mario Diano, the designer of the boat, tells us about the philosophy underpinning his production: very few buildings - two a year in the case of the 80' - and all of the highest quality; it is no surprise that they have been granted the CE Class, RINA Class and Maltese Cross (supervision mark). All Diano's yachts are made from materials used in the noblest traditions of shipbuilding, and wood has very few secrets for the master carpenters in the Riva Trigoso Yard. 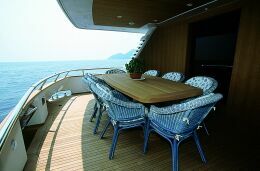 The double skin consisting of plywood and mahogany heartwood planking, with 40 mm thickness for the underwater portion of the hull and 20 mm for the sides and upper works, the oak main frames arranged every 40 cm with alternating intermediate vertical frames, the laminated mahogany bar keel, the West triple coating System followed by Boero paint cycles and AWL Grip finish, combine to create an exceptionally strong and monolithic hull. The bottom, a planing classic with runners and an outlet angle of 12- 13°, is a proven performer that has now been adopted on other models produced by the Yard: you don't change a winning bottom! A visit to the engine room, the real throbbing heart of the vessel, reveals that content is just as important to Mario Diano as form: the electrical, hydraulic and fire protection systems are built to first-class standards, with two mighty Caterpillar engines of 1420 HP each, capable of propelling the boat at a 27-knot cruise and a top speed of over 30 knots; at this speed, 7500 litres of diesel oil and 2000 litres of water provide a range of over 500 miles. 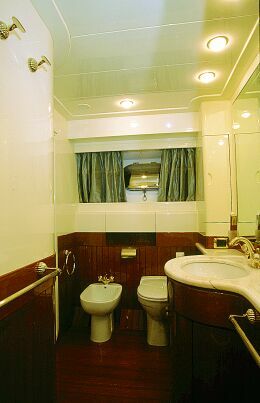 The soundproofing is particularly elaborate with alternating layers consisting of lead plates and materials specially designed for the abatement of all the frequencies; access to the machinery space is from the deck via stairs that also lead down to the crew accommodation spaces - twin cabins with separate bathrooms. The internal layout of the Diano 24 is chosen by the client: it's only right that someone buying something akin to a valuable made-to- measure piece of furniture should opt for a custom design in line with his own unique wants and desires. 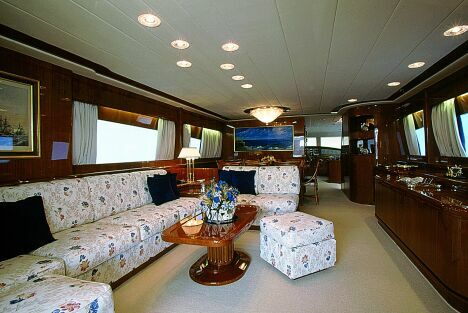 In this case the interior arrangement is a fairly classic style; on the main deck is the living area, saloon and dining nook, which can if desired be separated from the forward spaces and the cockpit; here, as everywhere else, the area is air conditioned, and there is a large settee and a dining table seating eight, a stereo, a liquid crystal television set, opulent marine style fittings and a pervading homey feel of cosiness thanks to the warm shades of the cherry interior; here the same wood has also been used for the flooring. 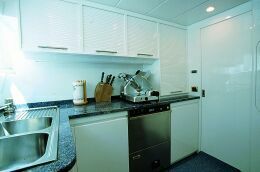 Forward, the galley is fully equipped for the creation of real Italian style culinary delights (or perhaps French haute cuisine): a foldaway table for the crew, two capacious fridges, lots of cupboard space, a deep freeze, a waste compactor, a large double sink, dishwasher, six-ring cooker, a worktop for food preparation, an oven that can comfortably handle a 10-kg bass, refrigerating room, cellar and a slicing machine. 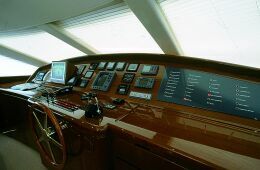 The bridge - the nerve centre containing all the electrical dials and controls and the stunning array of electronic equipment fitted on board - offers a commanding view and total control of the navigational horizon; the removable remote control for engines and bow- thrusters enables the Skipper to carry out manoeuvres from any position on deck. 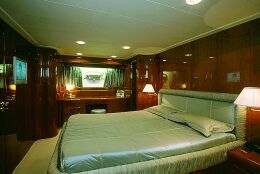 Stairs inside lead to the flying bridge and the lower deck, with the owner's suite situated aft. 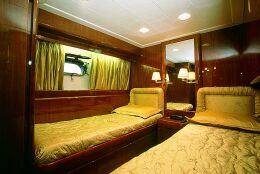 Here those lucky enough to be invited are accommodated in three spacious staterooms (all doubles), naturally with en suite bathroom and shower. Since this yacht is custom-built, all the interior decoration and fittings have been meticulously studied by Mario Diano himself, like everything else, so as to optimise the use of available space: from the lines of the bottom to the profiles, to the determination of weights and volumes. The upper deck, featuring the vast raised central sundeck, has a handy table and sofa as well as the navigating bridge; here, in front of the seats for the pilot and co-pilot, a thick sheet of raiseable Plexiglas protects the controls and navigational instruments. Abaft the roll-bar, which is positioned a fair way forward as always with this type of hull, is the yacht tender - in this case a 4.5-metre inflatable sportsboat - with its davit. The cockpit, which is simple and neat and shaded by the flying bridge above, appears to be an annex to the main lounge; ideal for romantic dinners against a backdrop of fiery sunsets, it has a table that seats eight. 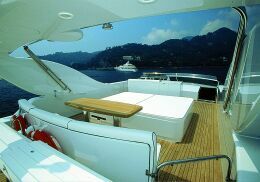 The walkways at the sides are wide and well protected and lead all the way to the forward sundeck. Our return and mooring at Santa Margherita go unnoticed; the electrical capstans and warping winches facilitate operations and the Prosecco offered to us by our wonderful guide is chilled to perfection: the "white wines zone" in the refrigerated part of the cellar is carrying out its duty impeccably, like all the other facilities on board. Water tank capacity: l 1,600. 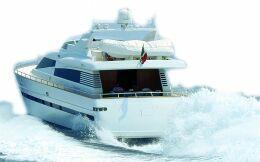 For information: Diano Cantiere Navale - via Vespucci, 16037 Riva Trigoso (GE) Italy - Phone +39 0185 44706 Fax +39 0185 482213.